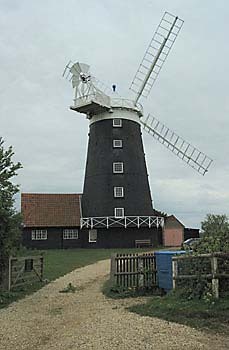 Burnham Overy tower mill was worked in conjunction with the nearby Burnham_Overy_lower_watermill and was built in 1816 by Edmund Savory. 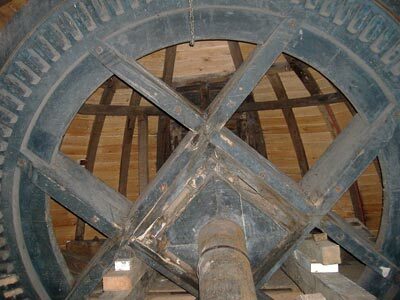 The mill was six storeys high, with a ground floor diameter of 24 feet and had a stage set around the first floor. The horizontally boarded Ogee cap had a ball finial on top and held a 6 bladed fan. The 4 double shuttered sails with a span of 81 feet, each had 12 bays of 3 shutters and drove 3 pairs of stones. We the undersigned Merchants & Millers do hereby give notice that on & from the first day of January next all Corn taken in by us will be by the New Imperial Bushel as by Law established. A steady, active & industrious SINGLEMAN who perfectly understands his business & can be recommended from his last position. Apply personally (or by letter post paid) to Mr. Savory, Burnham Overy Mills. 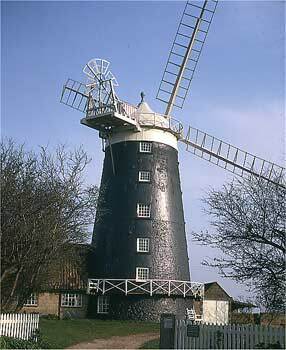 A Steady Active SINGLE MAN to take the entire charge of a Windmill working three pair of stones etc. None need apply that have not had considerable experience & can give respectable references. Apply personally or by Letter (post paid) to Mr. Savory, Burnham Overy Mills. A Steady Active SINGLE Man, who thoroughly understands his business. Apply personally to Mr. Savory, Burnham Overy Mills. A steady active Person as FOREMAN & STONEMAN who can have good recommendation. A married man will be preferred & a comfortable Cottage provided near the Mills. 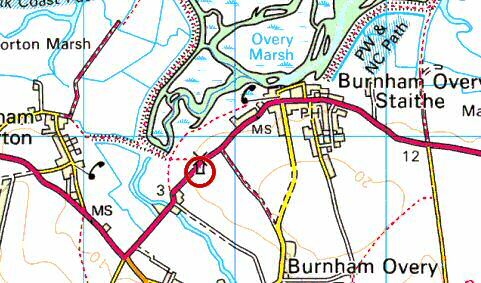 Apply to Mr. Savory, Burnham Overy Mills. Wanted, as ENGINE DRIVER & to ASSIST in the MILL, a Young Man who thoroughly understands the working of a condensing Engine. 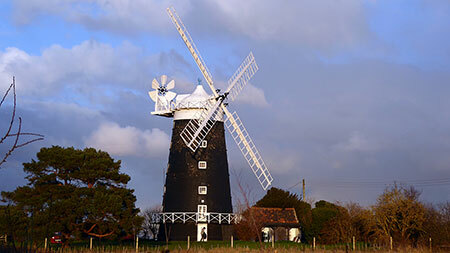 Apply by letter to John Savory, Burnham Overy Mills. On Saturday before H. E. Blyth Esq. & Major Holloway, a considerable time was occupied by the Bench with charges laid by the Officers of Excise under the Act of 1869. John Savory of Burnham Overy, miller & farmer was charged with keeping eight horses for trade purposes on the 30 th April last having only taken licenses for seven. WANTED, an experienced Miller as Stoneman to assist in the grinds. 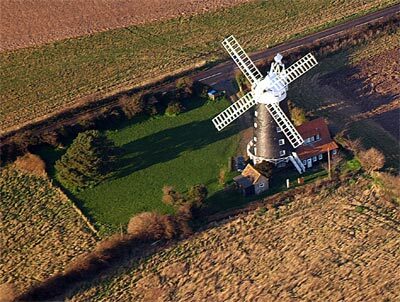 Apply to Mr. John Savory, Burnham Overy Mills. John Joseph was working at the mill in the 1870s and 1880s, possibly running the mill on behalf of the Savory family, before moving on to work at a mill in Sporle. Robert Haines jnr was an employee of the Savory family and probably worked at both the watermill and the windmill as had his father. He was born on 23rd December 1858. 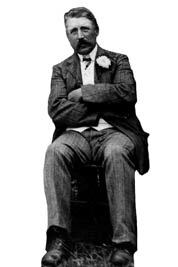 He married Esther at Burnham Overy on 28th December 1881. The birth certificates of three of his children give his occupation as journeyman miller and in 1913 the marriage certificate of his son Abraham gives his occupation as stone dresser. In 1914 Robert Haines jnr emigrated to Canada, possibly after the mill tailwinded that year. Robert Haines snr and jnr are my Great Great and Great Grandfathers. My father, who was ex Royal Marine, working for a local builder, painted the outside of the cap including the top, which he did with a rope tied around his waist. My name is Maggie Bennett (formerly Pannell) and I have many fond memories of the fabulous holidays we had at the mill with the Locke family, when I was a child. I remember the huge round table on the ground floor and how about 20 of us used to sit round and play a card game called Racing Demon, after dinner. Cows used to graze in the field outside and we called it the 'cows snack bar' as we used to enjoy feeding them grass. I also remember the wonderful walks along the unspoilt strand, the dyke out to sea and picnics in the pine forest. My father always used to sing a song ' Away we go to the mill, the mill just over the hill. The miller will grind the wheat to flour, it only costs a penny an hour. Away we go to the mill, away we go the mill. Slice, slice, the bread looks nice. Spread, spread butter on the bread. On top put honey so sweet, now we are ready to eat!' I don't know the author but it's engrained in my memory. 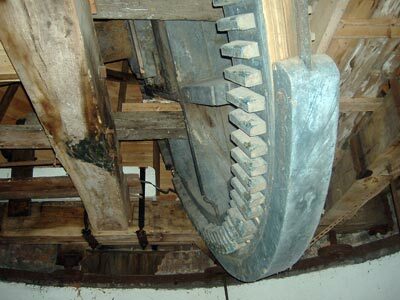 By the time Mr. H.C. Hughes of Granchester bought the mill in 1926, all the machinery had been removed. Mr. Hughes converted the mill for use as holiday lets and added the single storey extensions. In 1957, a fixed cap, new 62ft stocks weighing a ton each, skeleton sails, stage and fan were installed by the specialist millwrights R. Thompson & Son of Alford, Lincs. 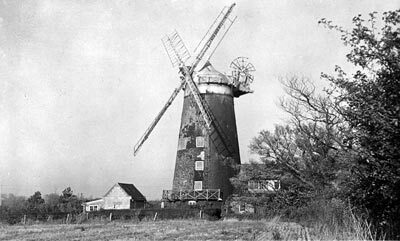 Mr. Hughes donated the mill to the National Trust in 1958 and soon after the sails were again replaced having deteriorated badly. 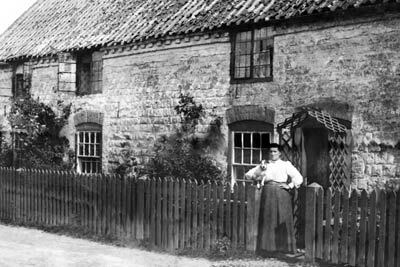 The National Trust then rented the towermill out as a holiday home. 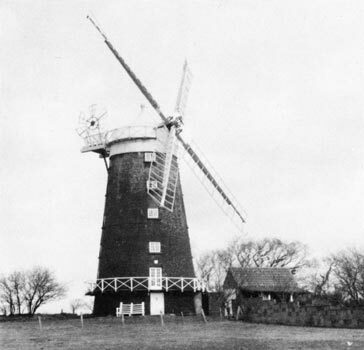 The National Trust Atlas of 1981 twice inaccurately described the mill as a wooden windmill instead of a brick tower mill. July 17:- Two 62-ft stocks of Jamaican long leaf pitch pine erected by crane. Also restored fantail using Canadian Douglas fir. Sails to follow 18 July. Cost to National Trust about £26,500. Interior woodwork of mill was renovated in 1981 to requirements of current fire regulations; fireproofing of concreted ground floor and upper storeys included fire resistant timber in first and second floors, fire precaution doors and partitions and a fire escape. 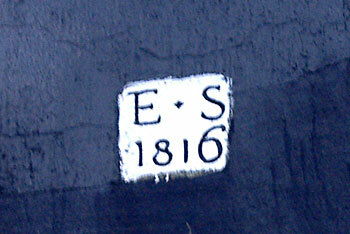 Steel shoes were fitted to rotting ends of some beams. Exterior was retarred. Cost £25,000. 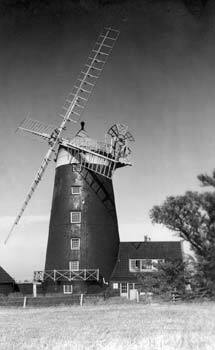 In January 1983 the four sails (and later the two stocks) were removed as having dangerously deteriorated. Replacements are envisaged, at about £2000 per sail and £3000 per stock. The mill is now let out all the year round to families and other groups; rent in ‘High Season’ £180 per week with a maximum of 20 persons at a time. "Daddy's" mill where we used to play when we were very young - we had a swing on the tree on the right. 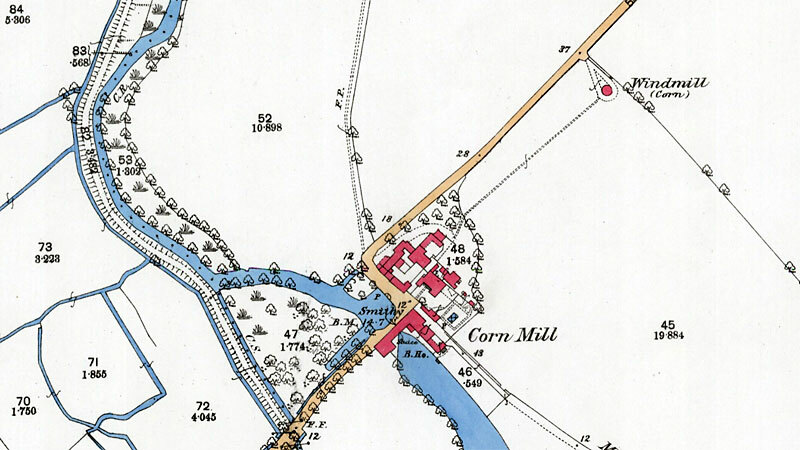 I have read through your information online regarding the mills history and think that John Joseph probably worked at the mill maybe for Mr Savory. Later, John Joseph went to work a mill at Sporle. 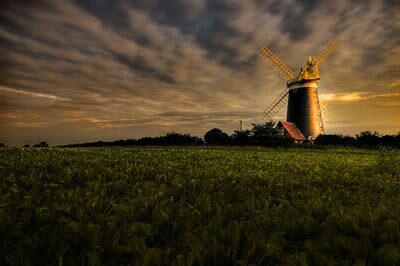 I just wanted to share a memory of Burnham Overy windmill. As a member of a school group from Watford Boys Grammar, we were taken to stay at the mill in 1976 (I think! ), we were ostensibly there for a weekend of birdwatching. However, I had just completed a school project on windmills (which won a prize! ), and the leader of our group was none other than Michael Harverson. At the time the trap doors were still in the floors from the sack hoist and we were bedding down on the third floor as I recall. One time I cam back up to our room I topped the staircase and went to walk over to my bed, only to fall straight through the trap door which someone had, rather stupidly, opened. I have little recollection other than finding myself on the floor below, I did not suffer any injury. Whether this had any bearing on my becoming a mill fanatic I don't know, but I have! I alao retain a very keen interest in birding. When I was an undergraduate at Cambridge (1969-72) I became a member of "Young Friends", through attending weekly meetings of the Society of Friends (Quakers). 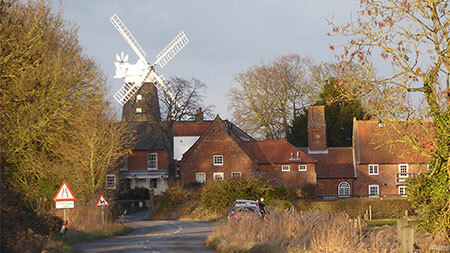 Each year, the group used to book an early summer weekend in the mill, two hours drive away. The tradition was to leave Cambridge about 4pm on a Friday, putting watches forward by two hours to 'Mill Time' so making the journey four hours (by our reckoning) and arriving in time for supper at about 8pm. We'd then spend the whole weekend two hours ahead of everyone else, which meant that Quaker meeting in Wells-next-the-Sea on Sunday morning was from 1-2pm (on our watches) instead of 11am-12noon (Norfolk time), but otherwise made no difference to us. For students it didn't seem too bad getting up at a "reasonable" time like 8am for breakfast on the Monday morning. THAT'S when the reason for 'Mill Time' became clear, as we would leave at 8.40am for 9am lectures. And we would arrive in Cambridge in time for 9am lectures, despite the two-hour journey ! At that time the accommodation was very basic. I can't remember beds. I recall using sleeping bags on the bare boards. The trap-doors were there and working and access to the cap for taking photos was easy too (all far too dangerous by today's standards).